Clayton Morris asked if the airline was really concerned about cost savings and spun it to say it was a passenger's complaint. Fr. Morris rejected that notion and went into a hissy, little rant which invoked the standard trope, in any Fox victimized Christian piece, that it's just a small minority of evil doers who are ruining things for Jesus' BFF's. He claimed that "a small minority has chosen to be extremely vocal and to say that separation of church and state or tolerance means that there can be no public expression of one's values and beliefs." He noted that this is a private company and asked "who's going to be offended by a prayer." He "joked" about all the things "shoved at him" on the flight including duty free and he could say he's offended by it." (Actually, he doesn't have to accept the list from the attendant.) He exhorted the audience to stand up and say that they "won't let the country become a soulless nation in which no one can express belief." 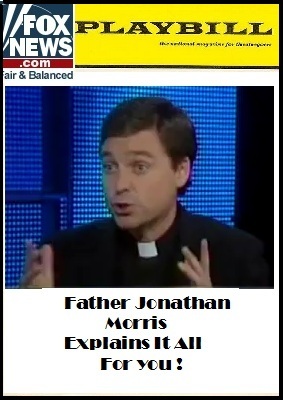 Dave Briggs then read a statement from the airlines which addressed diversity - a concept alien to Fox News and today's conservative Catholic Church which Dolan and Morris represent. A rather upset Fr. Morris asserted that it's not about diversity but a desire to have everyone be the same - an ironic comment given that Fox and Fr. Morris would love it if everybody were conservative, Republican Christians. A frenetic Fr. Morris lapsed into incoherence when he talked about expecting diversity if he flew on an Israeli airline where he would expect to learn more about the Jewish faith - about which he knows very little as Jews do NOT proselytize. He also doesn't seem to know that El-Al is a secular airline and that Israel's Proclamation of Independence is not a religiously based document. He finished with a flourish and a little pouty mouth when he proclaimed that if you get rid of religious beliefs "it's doing exactly the opposite of creating a diverse and respectful" (he shouted the word) "nation." BTW, check out the cute little padre's Facebook. Talk about idol worship! You have a place of worship don’t you? Alaska Airlines discontinued the prayer cards in coach class several years ago. I don’t recall the little propaganda padre having a hissy fit then. Father Spanky must be a regular only in first-class. Freedom of religion is not possible without freedom from religion. Regardless of the efforts of hose like Father Spanky, religion is still continuing to losing favor. Or maybe it’s because of this type of effort? Fr. Morris is pissed off because people don’t all believe in authoritarian religion. Never could find that Buddhist prayer card in the plane, though.